Visit @TunstallAPAC @AustHealthWeek expo from 15-17 March. Read how Tunstall and Women’s Refuge New Zealand are providing support to people affected by family violence, through customised connected care. Learn about the features of Tunstall 3G medical alarms, how mobile signals are received, and what options are available if you live in an area with sporadic mobile coverage. Congratulate our newly appointed Acting Customer Care Manager, Australia, and meet our new Business Development Manager for ACT, NSW and TAS. With our recent growth, we’ve updated our imagery to reflect our connected healthcare 2020 strategy and the connected landscape in which we operate. With the newly introduced mental health reforms, Tunstall is providing support to clients by including mental health first aid training for all employees. The results are in: Tunstall staff survey We love what we do and it shows. We’re pleased to announce that Tunstall’s 2015 annual staff survey results were impressive. Survey responses indicated that 94% of Tunstall staff feel proud to say where they work and 90% felt that our mission makes them feel like their work is important. 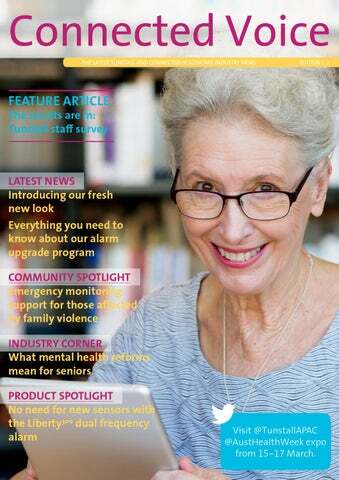 View all of the survey results on page 10.
speaking on ‘The Connected Person’ and the broader applications of in-home telehealth monitoring and smart technologies. Page 17 has all the details. Our friends at LifeTec host a range of fantastic and publicly available workshops in Brisbane and Townsville, with topics such as using assistive technology, managing arthritis, and using hoists and slings. You can view LifeTec’s upcoming workshops on page 14. We love catching up with you through our magazine, so please enjoy the read! 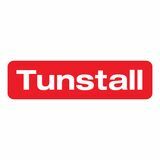 Introducing Tunstall’s fresh new look The old adage, ‘new year, new me’ could easily be applied to Tunstall’s vision for 2016 and beyond. Over the past few months, we’ve been dedicated to taking a holistic look at our company identity, and how it can better represent who we are and what we do. As we grow over the years, adding more services and products to our repertoire, it’s natural that our brand will adapt to suit our expanded capabilities. Here we’re giving you a look into Tunstall’s branding journey and what you can expect this year. Why the new look? With our recent growth, we have found that our markets, and subsequently the language we use to communicate, have changed. As we become a part of more people’s lives, it is important to continue to provide our clients with a coherent, consistent message and image. The way we look and sound as a brand is incredibly important, as it represents the personality of the company, and is a reflection of our work and how we wish to be perceived. Our refreshed image also ties in with the recently implemented five-year connected care and connected health strategy. At the core of the strategy is the goal of using assistive technology, supported by high-touch, high-quality services so that we can provide the best possible care for our clients. What’s changing? You may notice a few changes here and there in terms of the imagery that sits alongside our current branding. The use of bright colours is important to us, as they represent our friendly and positive approach as we aim to bring hope and happiness to our clients’ lives. Our new brand imagery aims to reflect our connected healthcare 2020 strategy and the connected landscape in which we operate. In terms of the language we are using, you’ll see outdated terminology such as telecare and telehealth being replaced by connected care and connected health to better convey our current offering and global market trends. We have expanded our company vision; to give people the freedom to live, not only as independently, but also as happily, healthily and securely as they’re able. Our logo is the same, and our approach hasn’t changed, so you can be sure to look forward to the same high standards of service and personalisation that make us who we are. We’re always happyCloud to discuss what we do, so don’t hesitate to get in touch with our team to find out what Tunstall can do for you. New Tunstall appointments Business Development Manager, Lawrence Henzell This month we welcome Lawrence Henzell, our new Business Development Manager for ACT, NSW and TAS, to the team. Lawrence brings over 30 years of sales experience to Tunstall, having spent the last nine years as a Business Development Manager in the pharmaceuticals industry and prior to that, providing customised wheelchair solutions in the rehabilitation industry. Lawrence was drawn to the position at Tunstall because of our company vision, as he is passionate about improving people’s lives and the satisfaction this brings to both clients and employees. Acting Customer Care Manager, Di Hobson Di Hobson, our excellent Customer Care Services Manager for New Zealand, has bravely accepted an additional set of responsibilities, as she steps into the role of Acting Customer Care Services Manager for Australia. Di has consistently demonstrated her commitment to Tunstall Australasia, as well as her capacity and dedication to delivering an exceptional level of customer care and experience we expect for our clients and customers. We know that our entire Customer Care Services team will benefit from her leadership and vast customer service and contact centre quality expertise. Women’s Refuge is New Zealand’s largest provider of services for those at risk of experiencing family violence. The organisation consists of 37 independent refuges delivering services across 41 sites from Kaitaia to Invercargill. Tunstall has been rolling out the installation of ConnectMe alarms as well as Liberty alarm units over the past few months, with the project running ahead of schedule. Over three years, the project will see more than 900 alarms rolled out across New Zealand. NCIWR member refuges provide 24-hour access to safe emergency accommodation and a 24/7 crisis line. They also offer community support and advocacy, domestic violence support, and education programmes. The Whanau Protect - National Home Safety Service provides nationwide assistance with the purpose of enhancing the security of client’s homes. As part of the service, family violence victims are offered Tunstall safety alarms with 24/7 monitoring. Our relationship so far has been an extremely positive experience. Tunstall has been effective, responsive and easy to communicate with. Tunstall provide a customised monitoring service for the Women’s Refuge Whanau Protect National Home Safety Service, where calls are answered in silent mode so as not to alert an offender of its activation. Our trained care consultants will answer the call and take the necessary action, with the audio recorded so that it can be used as evidence in court should the need arise. “It’s a privilege to be involved in providing services and solutions to Women’s Refuge. They perform a valuable and important function in our community and knowing that what we do helps them and the women they support in the community is very rewarding for the whole Tunstall team,” says Stephen Murray, General Manager at Tunstall New Zealand. COMMUNITY SPOTLIGHT Working with Tunstall Talking with Dr Ang Jury, Chief Executive of Women’s Refuge, the organisation’s experience with Tunstall so far has been a successful one. “Our relationship so far has been an extremely positive experience,” says Dr Ang Jury, “Tunstall has been effective, responsive and easy to communicate with.” “All services have been delivered as promised – on time and within budget. Company representatives have been very accommodating in working with us around what can sometimes be a challenging client group with exacting security and safety concerns.” By utilising the service provided by Tunstall, Dr Jury explained that the Women’s Refuge is able in many instances to create a level of security that enables clients at risk of serious harm to remain in the familiar surroundings of their own home. This avoids adding a layer of chaos and disruption to what are already generally very difficult and traumatising circumstances for them and their children. “Clients are able to maintain their usual support networks rather than being relocated (often at some distance from their usual location), meaning that children in particular do not suffer any greater sense of upheaval than is already occurring as a result of violence,” Dr Jury concluded. Mental Health Reforms At Tunstall Healthcare, we pride ourselves on being sensitive to shifts both in terms of our clients’ needs, as well as changes in the industry at large. When the Minister for Health, Aged Care and Sport, The Hon Sussan Ley MP made the announcement that the Government would be introducing mental health reforms, we knew we would have to consider our own role in light of the coming changes. Australia’s mental health landscape With Australia’s high rates of mental health issues, there is a growing need to support those in need of assistance to live as fully and independently as possible. The DOH reports that some 4 million Australians suffer with a mental health issue each year, making the issue one of pressing urgency. Regarding older Australians, Beyond Blue estimates that 10-15 per cent of those living independently will experience depression, with about 10 per cent suffering from anxiety. The older cohort of people that form the core recipients of Tunstall’s service offering are particularly at risk of developing mental health issues, with contributing factors including personal loss or another form of physical illness. Tunstall’s approach to facing the challenges of mental health Our medical alarms and other assistive technologies all play a role in aiding older Australians with a range of long-term care and health needs to live in the comfort of their own homes while allowing them to have the peace of mind that help is always at hand. In addition to enabling clients to live independently, it also reassures their loved ones and carers, as well as keeps clients out of the hospital. Given the nature of our relationship with our clients, we have a responsibility to offer them the very best care and support. Communication is a key component of our business; the connection that we have with our clients relies on understanding, respect, and addressing their needs. To provide additional support to our clients who live with a mental health issue, we have taken steps to integrate mental health first-aid as a core part of employee training. This not only enables our employees to better respond to our clients’ needs, but it also expands our capacity to offer care and support to thousands of Australians. When left unchecked or untreated, mental health issues in seniors can lead to an increased risk of illness as well as worsening of other health symptoms. Depression and anxiety, in particular, can lead to malnourishment and inactivity. What the reforms mean for seniors with mental health issues There will also be more support for organisations that provide senior care, giving them the resources to help tackle some of the issues that families and carers face surrounding loneliness, depression and dementia. Tunstall looks after about 70,000 people within this specific demographic across various locations in Australia, and what we see on a day-to-day basis is that they fiercely want to maintain their independence. While Australia is a country where it is possible for older people to stay in their homes, it is important to remember that a number of people live in isolation. Services in certain locations may not be readily available to those who need them, so by employing more assistive technology, or alternative, cost-effective solutions (delivered over IP, digital platforms or by telephone), we hope to provide additional support to the more vulnerable members of society. Traditionally we have provided preventative services, so we are moving into a new era of being able to provide proactive services such as call management, welfare checks and social intervention calls. Tunstall employees It’s extremely important to have services that sit between the health professionals, the carer and loved ones, so that we can provide regular information and detect trends. By increasing the skills of our teams to include a mental health awareness program, we can further empower our teams to be able to detect and manage a mental health crisis. There is a social stigma that still surrounds mental health, and the older people whom we deal with will often come from the ‘stiff upper lip’ era, where they don’t want to trouble other people, it’s a complex area, which is why we have to be so sensitive about implementing new services. With our broadened services, Tunstall hopes to intervene before a client reaches a critical level of care, giving them the confidence to stay in their own home as well as the chance to be happier and healthier. The results are in: Tunstall staff survey After an action-packed 2015, Tunstall Healthcare is excited to leap into the new year and everything it may bring. With the results of the recent staff survey in, we couldn’t have asked for a better start to 2016. Overall, it’s not difficult to see why we are excited not only by the results, but also by the fact that we have continued to build upon our close-knit, welcoming staff culture to create a place where people are proud to work. “Surveys are important for many reasons. The results highlight where we excel but also show what we need to improve,” says Tunstall’s Managing Director, Lyn Davies. “I am pleased to say that the 2015 annual staff survey results were impressive.” The importance of engagement Here at Tunstall, we offer a range of connected care solutions to people in need of assistance and reassurance across Australia and New Zealand. But we’re also proud to provide our 24/7 monitoring service, to make sure no call goes unanswered. Offering such a service to our clients ensures that they have the opportunity to live more independently, while granting them, their loved ones and carers peace of mind that help is always close at hand. However, an organisation can only see real success if its employees, who are its foundation, are engaged and dedicated to their work. According to the staff survey, a staggering 90 per cent of Tunstall employees felt that our mission makes them feel like their work is important. In addition, the majority of respondents (88 per cent) understand how what they do contributes to the achievement of business outcomes. The opportunity to succeed We want our employees to feel like they have the chance to succeed when they come to work each day. One of the simplest measures a place of employment can take to ensure people have the tools to excel is to make sure employees know exactly what is expected of them – a statement that 91 per cent of respondents agree with. Furthermore, 86 per cent of Tunstall employees believe that they have the opportunity to do their job the best they can every day while 85 per cent state that their immediate manager inspires them to meet their professional goals. Creating an environment of trust It’s important that our staff feel that their workplace is somewhere they can truly fit in and feel welcomed. This entails not only having a good relationship with fellow co-workers but also the management team. The survey revealed that 94 per cent of respondents believe that their supervisor or someone at work cares about them as a person – an important factor in helping people feel like an active part of the organisation. “I felt that my own responses were reflected through the survey results, so it was pleasing to know that my colleagues share the same high-level employee satisfaction that I do,” says Marketing Coordinator Jessica Cruff. “I enjoy working with such a positive team in a supportive environment, knowing that what I do contributes to making a difference to the lives of our clients.” An even more heartening finding is the 88 per cent of Tunstall employees who trust a co-worker the same way that they would a friend. “I was also proud to see positive results reflecting the friendly and compassionate company culture that Tunstall has achieved,” Ms Cruff adds. 94% of responders feel proud to tell people where they work. In terms of development, four out of five respondents believe that someone in the organisation encourages them in this regard. Additionally, in the past six months, 81 per cent of respondents have talked with someone about their progress at Tunstall – we love to see our employees taking initiative and thinking about the future. Last but not least, the survey revealed that 94 per cent of respondents feel proud to tell people where they work, which is perhaps one of our greatest achievements to date. “I would like to thank everyone for bringing their motivation, compassion and enthusiasm to work every day. This is making a difference not only to our customers, but also to each other,” concludes Ms Davies. You can find out more about our range of assistive technology online, or you can click here to find out more about careers at Tunstall. Alarm upgrade program As technology continues to evolve, so do the associated connected care systems that rely on these upgrades. Currently, the national broadband network (nbn™ network) rollout is changing the way Australians receive a number of key services. With faster internet becoming essential for the modern home, it’s important that the various products people rely on, such as medical alarms, evolve to keep up. Below is everything you need to know about the new alarms. connected care service the most. From 2016 onwards, Tunstall is working to upgrade all medical alarms to work on 3G, a wireless mobile service that provides an independent connection to the nbn™ network. Most importantly, 3G connections are significantly less likely to be compromised in the event of a power outage than the new landline connections. In response to the nbn™ network rollout, Tunstall is currently in the midst of an alarm upgrade project that will ensure its clients receive a future-proofed emergency monitoring service. Naturally, this announcement will prompt a number of questions from people currently using medical alarms and those looking to upgrade. Below is everything our clients need to know, from the benefits of the improved alarms to what they need to do to prepare. How will medical alert alarms improve with the nbn™ network? the 3G alarm upgrade schedule, some clients may be offered the chance to obtain a new phone and internet service provided over the nbn™ network while still relying on the old landline medical alarms. If this is the case, the device will continue to operate with the same functionality, but may not work as intended during the event of a power outage. Because of this, Tunstall recommends clients hold off on moving their phone service to the nbn™ network until they receive their upgraded 3G alarms to be sure of extended coverage in the event of a power outage, or alternatively contact Tunstall prior to connection to the nbn™ network for further advice. Is it possible to boost the quality of the wireless signal? The new medical alarms offered by Tunstall are 3G enabled and rely on the same wireless mobile connection as current mobile phones. In some cases, if clients believe the mobile phone service in their area is not stable they might be concerned that their 3G medical alarm won’t work well either. There are a range of solutions to address this particular concern, ensuring clients in any location are able to put their faith in their upgraded medical alarm. For those clients located in areas with less reliable mobile connectivity, extension aerials or high-gain antennas can be provided by Tunstall at no extra cost. Making the most of the nbn™ network rollout In summary, Tunstall’s alarm upgrade ensures these devices are on par with Australia’s new supporting telecommunication infrastructure. It’s important that assistive technology evolves along with the rest of the industry, as this means clients can use medical alert devices with full confidence. The next two years promise to be an exciting time for Tunstall and our clients, with the 3G upgrades to current medical alarms ushering in a new standard for connected care in Australia. LifeTec workshops LifeTec is a fantastic organisation that specialises in providing information and advice on assistive technology for use at home, work, school, or in the community. LifeTec hosts a range of valuable workshops at both their Brisbane and Townsville locations. Workshops are available to the public, as well as healthcare and community professionals. Topics for upcoming workshops include the use of technology in the home, managing arthritis, and skill building for client transfers using hoists and slings. Enabling Seniors Through The Use Of Tablets Thursday 17 March - 9:00am | LifeTec Queensland, Newmarket This workshop will provide an overview of tablet use options and considerations for seniors at home, in community settings, for leisure and social activities. For more information about LifeTec’s SMART AT consumer workshops. This workshop is suitable for carers and support workers who are new to hoist and sling transfers or would like a refresher. The workshop will cover theory and practical aspects of client transfers with mobile floor hoists. Managing Arthritis – Product update Thursday 21 April - 9:00am | LifeTec, Townsville Is Arthritis impacting your ability to perform activities in your everyday life? Fundamentals of Assistive Technology Tuesday 31 May - 9:00am | LifeTec Queensland, Newmarket This practical and interactive skills training focuses on the valued role that community care workers provide in supporting the AT journey for people with disabilities. As Australia’s telecommunications infrastructure evolves, so too do our alarm offerings, ensuring we’re at the forefront of technology for our clients. In this edition, we’re putting a spotlight on the Liberty300 3G dual-frequency medical alarm. With all the functionality of the Tunstall Liberty300 3G alarm, plus an additional radio frequency, the new dual-frequency Liberty300 alarm is the perfect solution for clients with existing sensors on frequency 303MHz looking to upgrade to a mobile 3G alarm. As with the single-frequency model, the Liberty300 dual-frequency alarm works on the 3G mobile network, providing an independent connection to the nbnTM network. The alarm also has over 40 hours of back-up battery life, ensuring clients are safe during a power outage. The Liberty300 dual-frequency medical alarm is the ideal solution for clients with large volumes of existing sensors, such as residential homes. Each alarm can interface with up to 15 wireless sensors, and is compatible with sensors on both the 303MHz and 915-928MHz bands. Using plug-and-play technology, sensors can be easily added, catering to the changing needs of individual clients, without the need for specialist knowledge or assistance. The Liberty300 dual-frequency 3Gmedical alarm is available now. To find out more about the product, or to arrange a purchase, please contact your account manager or our friendly customer service team at info@tunstallhealthcare.com.au or on 1800 603 377. Warren, our Telehealthcare Consultant, is one of Tunstall’s longest serving employees. He shares his connected care wisdom by providing training and support to our customers and installers. In this edition’s Tech Talk, we’ll be going over the features of our 3G medical alarms and how they operate, free of physical landlines. We’ll also cover how mobile signals are received, and what options are available for your clients who live in areas with sporadic mobile coverage. GSM (Global System for Mobile Communication) is the default global standard for mobile communications, and the 3G network provides a platform for digital communications for a range of mobile products. Our Liberty300 alarm works on these networks, allowing it to communicate with the wider telecommunications network without a physical landline connection. As mobile devices rely on fixed transceivers for network coverage, not all geographical areas will have the same communications strength. If you have a mobile phone, this is represented by the ‘bars’ displayed on the screen, with five ‘bars’ representing the highest coverage. If you live in an area with typically low network coverage, there are a range of accessories for your 3G medical alarm which can improve the strength of your connection and ensure that adequate communication can take place between your alarm and the network. We have extension aerials, which increase size of the aerial and thus expand the coverage of the alarm’s existing aerial. Or we have high-gain antennas available, which are directional antennas with a narrow beam width, enabling more precise targeting of the radio signal, increasing its capacity to pick up on network signals. If you’re interested in finding out more about our 3G medical alarms, or to arrange a purchase, please contact our friendly customer service team at info@tunstallhealthcare.com.au or on 1800 603 377. View more how-to films on our YouTube channel. Have a question for Warren? We invite you to visit us at the following events to learn more about our products and services. We’re proud to announce that over the next quarter, we’re bronze sponsors for the 2016 Leader’s Summit and silver sponsors for the Australian Telehealth Conference. conversation to the next level, setting the scene for building scale and impact.